Long Beach State senior Josh Tuaniga was the 2018 AVCA Player Of The Year. Photo by Stephen Dachman. 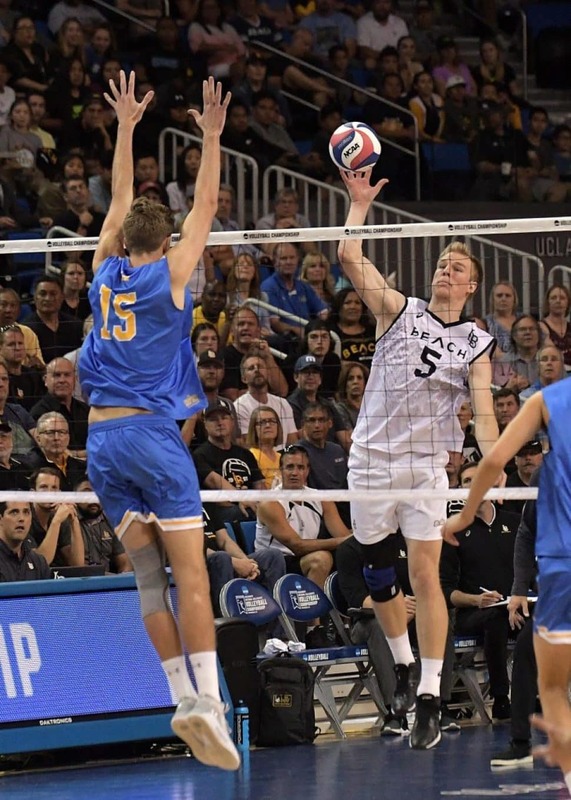 Elite sports teams don’t typically get to map out their own route to greatness, but there’s nothing typical about the 2019 Long Beach State men’s volleyball team. LBSU pulled off an improbable comeback at UCLA last year to win its first National Championship since 1991, and fate would have it that the Walter Pyramid is set to host this year’s NCAA Final Four festivities. A successful title defense in their own backyard would give this LBSU team a real argument as the greatest to come out of Long Beach. LBSU senior All-Americans TJ DeFalco, Josh Tuaniga, and Kyle Ensing are as good as any top three players on any NCAA team in any sport. DeFalco and Tuaniga have won the last two AVCA National Player Of The Year awards, and Ensing will once again be the best opposite hitter in the country. DeFalco and Ensing also spent last summer as starters for the U.S. Men’s National Team as the only two collegiate players to make the squad. “They’re what you hoped they’d be coming in,” Long Beach State head coach Alan Knipe said of the epic recruiting class that has made three NCAA Final Four appearances. DeFalco has won every major award since arriving in Long Beach for the 2016 season, including multiple Player of the Year honors. The outside hitter has collected 1,360 kills, 642 digs, 244 total blocks and 131 service aces at LBSU. DeFalco had the chance to depart for a lucrative pro contract overseas, but wanted to finish his career with his teammates. Tuaniga is the best setter in the country. He also won every major award at LBSU, including the 2018 AVCA Player of the Year, while averaging 10.93 assists per set in 98 career matches played. Tuaniga played in the NCAA Final Four last year on what turned out to be a partially torn patellar tendon, and gave his personal championship trophy award to the LBSU athletic training staff for helping him stay on the floor. Ensing took his game to the next level last season while improving to 3.55 kills, 0.85 blocks and 4.34 points per set. Sometimes the opposite hitter doesn’t get as many chances to attack the net, but Ensing made it count with a .355 hitting percentage. LBSU broke its own NCAA record with a .379 team hitting percentage.LBSU also returns All-American middle blockers Nick Amado and Simon Anderson, as well as starting libero Jordan Molina, an LBCC alum. The only new starter will be the second outside hitter, where Louis Richard has been a bright spot so far. Long Beach State senior Kyle Ensing is the latest 49er to play with the USA Men’s National Team. Photo by Stephen Dachman. Knipe has pulled out all of the stops to have this recruiting class in this situation, and he’s also created new ways to keep his team focused. He even showed them a documentary about the Blue Angels during the offseason to emphasize attention to detail. However, the biggest compliment Knipe’s program could’ve gotten was the return of DeFalco, Tuaniga and Ensing. Although there were professional opportunities overseas while preparing for U.S. National Team duties, they’re back at LBSU ready to grind through another season with a details oriented coach who also has international experience. Most of the credit for building such a complete and accomplished roster goes to Knipe’s coaching staff full of alums like Nick MacRae and Scott Touzinsky. Knipe, the 2018 AVCA National Coach of the Year, also won the national championship as a player at LBSU. The tight family circle will get tighter next season when Knipe’s son, Aidan, comes in as the setter for next year’s class of recruits. 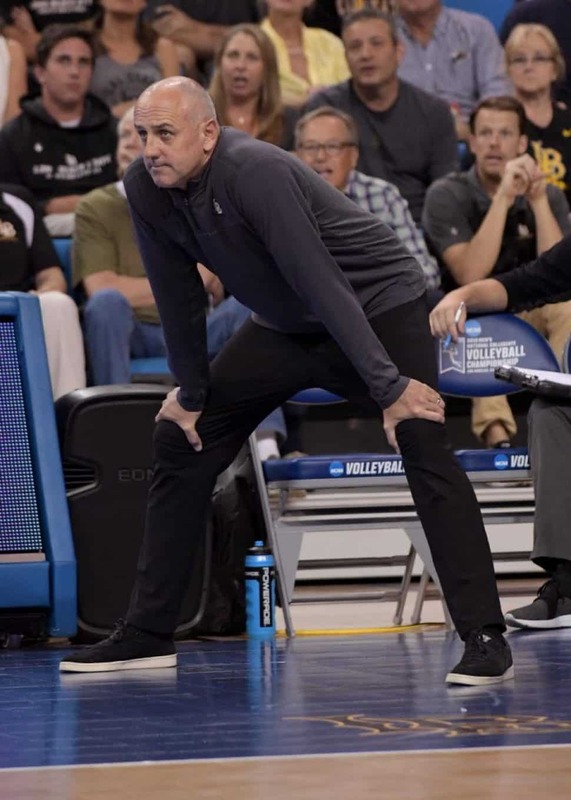 Long Beach State coach Alan Knipe is one of only four men’s volleyball coaches to win an NCAA National Championship as a player and a coach. Photo by Stephen Dachman. As defending national champion and consensus top-ranked team, the BE/\CH will be a big target all season long while playing one of the toughest schedules in the country. LBSU will end up taking on some of the best volleyball programs in the nation twice this year before starting the postseason in April. The first home match of the season is this Friday at 7 p.m. when LBSU hosts USC, and hoists the 2018 NCAA National Championship banner into the Walter Pyramid rafters. The championship rings were handed out during halftime of the homecoming men’s basketball game in November. LBSU will also host its annual tournament on Feb. 9 when No. 10 UC Santa Barbara, Penn State and No. 12 Ohio State come to town. Less than 24 hours after facing Penn State on Friday night, the Beach will be back in action against Ohio State on Saturday. LBSU beat the Buckeyes 25-22, 25-23, 25-27, 32-30 in the NCAA semifinals last year thanks to an epic fourth set. The Beach leads the all-time series 11-2 against Ohio State, and these programs could meet in the Final Four again if they’re both automatic qualifiers. To be an automatic qualifier again, the Beach will have to win the second annual Big West Conference Tournament. Last year, LBSU finished its regular season by splitting a pair of five-set thrillers at Hawaii, and then beat Hawaii at Walter Pyramid in the conference championship match. This year, LBSU finishes its regular season with back-to-back games at home against Hawaii, and then travels to Hawaii for the Big West Conference Tournament on April 18-20. LBSU will make history almost every time it plays this year as individual and team records fall. DeFalco will end up top 10 in kills and service aces, and Ensing is currently No. 19 in kills. Tuaniga is sixth in total assists. That trio has helped guide their team to three Final Fours of the seven in program history. No LBSU program has ever won back-to-back NCAA crowns, and the Beach could end up doing it on their own home floor. LBSU is also coming off of a 28-1 season, which is just the fifth one-loss national champion since 1985. An undefeated season is one of only a few possible accomplishments left, and would just add to an already impressive legacy that will come to an end in Long Beach, one way or another.